Are you wondering if you can file for naturalization if you have a criminal conviction? According to the Immigration and Nationality Act (INA), lawful permanent residents (green card holders) who have been convicted of an “aggravated felony” on or after November 29, 1990, are permanently barred from establishing “good moral character” for naturalization. Since having a “good moral character” is one of the key requirements for a nationalization petition, if you have committed a crime and it is one of those considered very serious such as an aggravated felony, you may not be eligible for a naturalization petition. What are the consequences of having conviction of an aggravated felony? If you have been convicted of an aggravated felony, you may be punished by being deported and/or barred from ever becoming a U.S. citizen no matter how long you have previously resided in the United States. 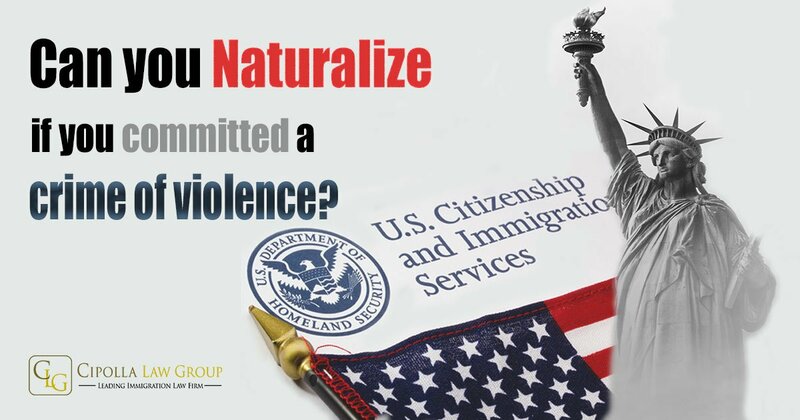 Can you still file for naturalization if you have a criminal conviction such as an aggravated felony? Section 16(a) is known as the elements clause, while section 16(b) is referred to as the residual or catch-all clause. In Sessions v. Dimaya, the Supreme Court held that section 16(b) is unconstitutionally vague. James Dimaya is a native of the Philippines who was admitted into the United States in 1992 as a lawful permanent resident of the United States. Dimaya was convicted twice for first-degree burglary under California law, neither of which involved violence. After his second offense, the U.S. government sought to deport Dimaya as an aggravated felon. An Immigration Judge and the Board of Immigration Appeals (BIA) held that California’s first-degree burglary is a “crime of violence” under section 16(b) and thus, Dimaya could be deported. The Ninth Circuit, relying on Johnson v. United States, 756 U.S. ___ (2015), held that section 16(b) was unconstitutionally vague. The Supreme Court granted certiorari, and adhering to their analysis in Johnson, affirmed the Ninth Circuit’s decision. Dimaya’s case will now return to the BIA. The Supreme Court’s decision did not automatically grant Dimaya the right to stay in the United States as a lawful permanent resident. It determined that the catch-all clause in section 16(b) is unconstitutionally vague. The BIA will need to redetermine whether or not Dimaya should be deported. What this Means for Lawful Permanent Residents Who Want to Naturalize? After Sessions v. Dimaya, if a permanent legal resident has been convicted of a crime not involving violence, he/she may be able eligible for naturalization because the crime may not constitute a crime of violence as defined by section 16(a) of the INA. Accordingly, the crime may not be an aggravated felony and the applicant will not be barred from establishing “good moral character.” However, like Dimaya, a permanent resident with a criminal history is not immune to deportation and should seek help from an immigration attorney if considering naturalization. When should I contact an Immigration lawyer? If you are considering naturalization and have a criminal conviction, been arrested or have a pending criminal case, you should contact an experienced Immigration lawyer before making any travel plans or applying for naturalization. At Cipolla Law Group, our immigration lawyers are experienced in representing individuals to overcome hurdles of becoming U.S. citizens through the naturalization process. Contact our Chicago Immigration law firm today for a confidential consultation. ← FY 2019 H-1B approved cases received!